*Eric Grasser MD LLC dba Unity Medicine receives a small commission when products are purchased through this website. Amp up your digestion! G.I. Fortify is designed to support a healthy G.I. environment, microflora balance, bowel regularity, colon cell function and detoxification. Supports short chain fatty acid (SCFA) production and promotes healthy intestinal cellular integrity. Enhances the protective mucosal lining with l-glutamine, an important energy source for the G.I. tract. Heal your leaky gut! GI Sustain is formulated to provide specialized nutritional support, including amino acids and prebiotic fiber, combined with readily digestible macronutrients for patients with leaky gut syndrome. Featuring L-glutamine and isomalto-oligosaccharides (IMO), this formula supports intestinal mucosal integrity and promotes the growth of beneficial bacteria to address dysbiosis associated with leaky gut syndrome. Nutritional support for conditions associated with Type 2 Diabetes. Supports insulin sensitivity with therapeutic levels of cinnamon. Promotes healthy glucose metabolism and insulin function with chromium, biotin, and magnesium. Supports healthy heart function by providing soy protein and plant sterols. A great way to supplement your daily fiber intake, with 7 grams of fiber per serving. Herbulk supports healthy intestinal function and integrity. It also creates a feeling of fullness and can help those who have occasional loose stools. UltraGlycemX is a medical food formulated to meet the specialized nutritional needs of patients with type 2 diabetes, insulin resistance, and hypoglycemia. Featuring chlorogenic acid from green coffee bean extract, barley beta-glucans, cinnamon bark, and 11 grams of dietary fiber per serving, this formula provides enhanced nutritional support for glucose, lipid, and insulin metabolism. Excellent support for healthy digestion. UltraInflamX Plus 360 is a medical food that provides specialized nutritional support for individuals with compromised gut function. It provides a powerhouse of nutrients including selenium, zinc, calcium, folate and vitamin B12. L-glutamine is added to the formula to support intestinal mucosal cells. 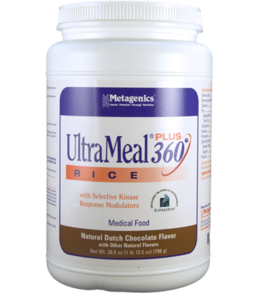 UltraMeal PLUS 360° is a rice-based medical food formulated to provide specialized nutritional support for patients with metabolic syndrome and cardiovascular disease. Proprietary formula features SKRMs—reduced iso-alpha acids (RIAA) and acacia—clinically shown in a preliminary study to improve fasting insulin and lipid parameters. UltraMeal PLUS 360° is a soy-based medical food formulated to provide specialized nutritional support for patients with metabolic syndrome and cardiovascular disease. Proprietary formula features SKRMs—reduced iso-alpha acids (RIAA) and acacia—clinically shown in a preliminary study to improve fasting insulin and lipid parameters. The information and contents contained on Dr. Grasser | UnityMedicine Web Site is provided for informational purposes only . You should not use the information available on or through Dr. Grasser | UnityMedicine Web Site (including, but not limited to, information that may be provided on the Dr. Grasser | UnityMedicine Web Site by healthcare or service professionals employed by or contracting with Dr. Grasser | UnityMedicine) for diagnosing or treating a health problem or disease, or prescribing any medication. Information and statements regarding dietary and other health care supplements have not been evaluated by the Food and Drug Administration and are not intended to diagnose, treat, cure, or prevent any disease. You should read carefully all product packaging prior to use and consult with your health care professionals.